Trade When You See Edge. Stand Aside When You Don’t! 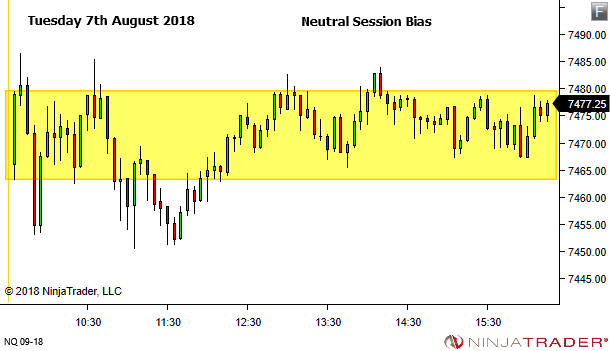 A few weeks back we discussed a quick and simple method for identifying a "bigger picture" directional bias. 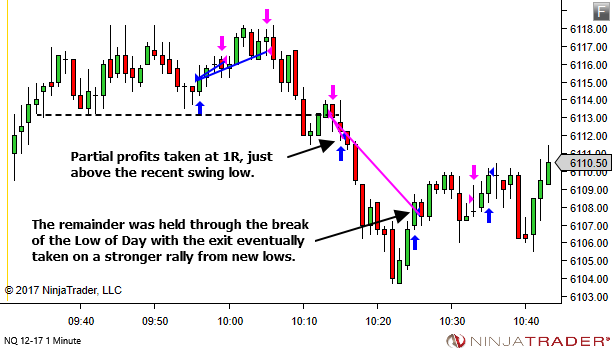 See here if you missed it and want to review the idea – Part 1, Part 2. 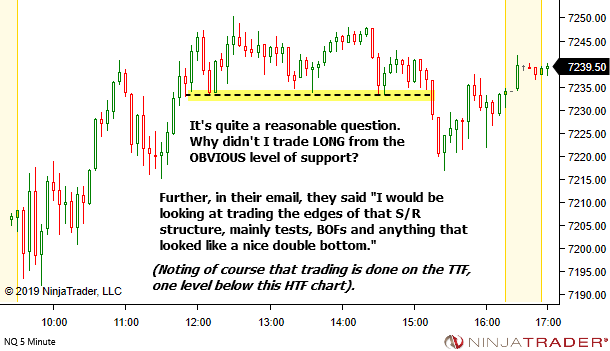 The second article generated quite a bit of good email conversation, with several traders now adding this to their current trading process. One email included a brief question, which I feel it is important to discuss with all of you today. 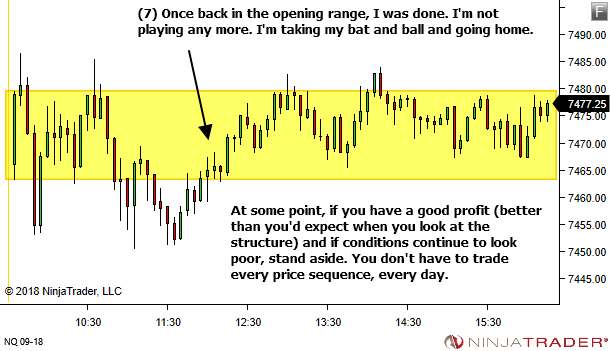 "I always looked at the opening range as something that worked some times (when the market did move) and didn't work other times (when the market didn't move). So you taught me a great lesson here. 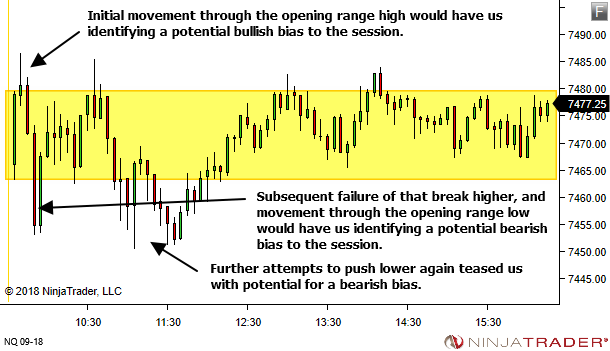 It works all the time, because that failure of price to move from the opening range is the information we need to identify a lack of directional bias. 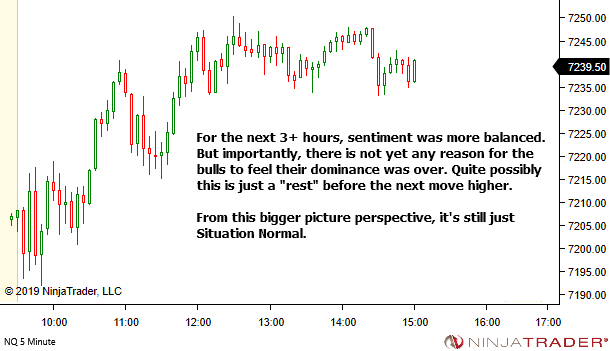 What I would love to see though is how you traded one of these days that were neutral bias throughout the whole day. Like on the Tuesday for example, you said "My preference is to stand aside". 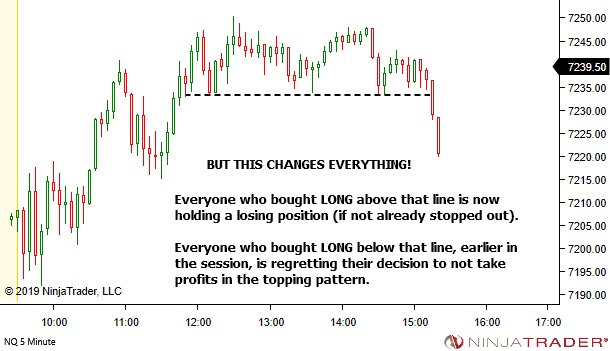 Does that mean you didn't trade at all? Or at what point did you stop? 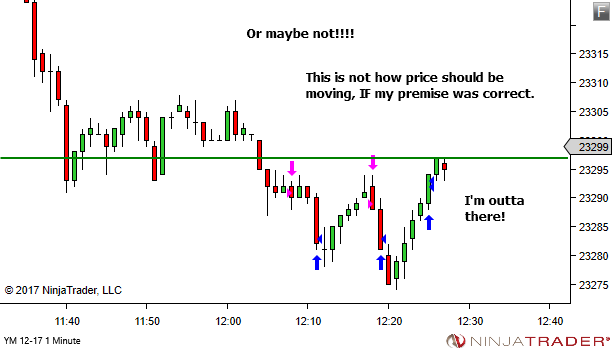 Or if you did trade at any time, what was the reasoning at the time?" Let's look back at the session on that Tuesday. 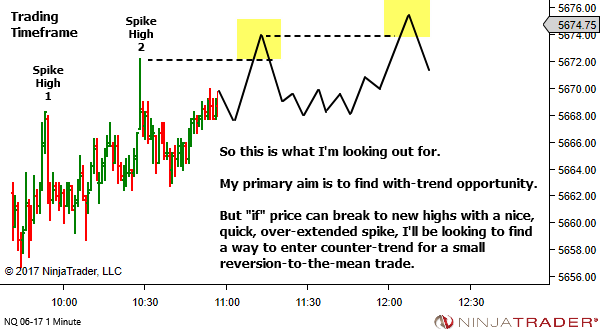 This was the higher timeframe chart, with the opening range, as discussed in the prior article series. Clearly a neutral bias throughout the vast majority of the session. 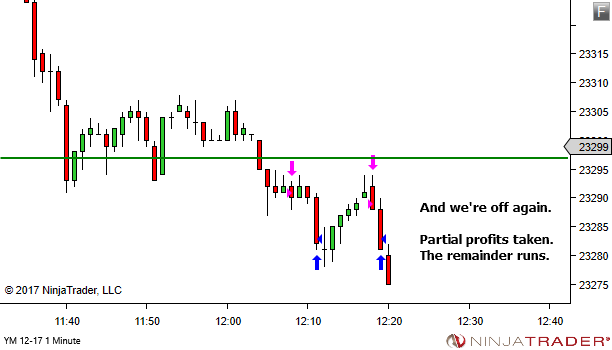 But yes, I DID make some trades. Before we examine the trades, there are two key points I want to make. 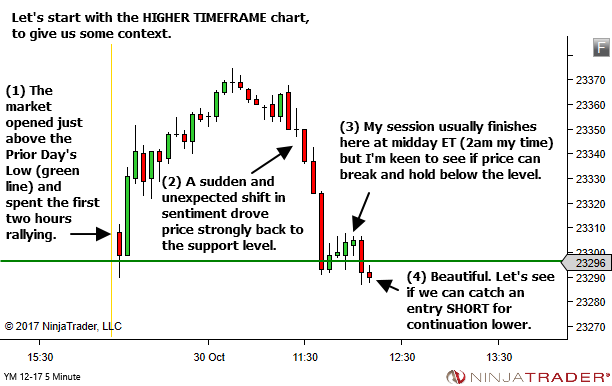 Firstly, we need to remember that the image above is the HIGHER TIMEFRAME chart. 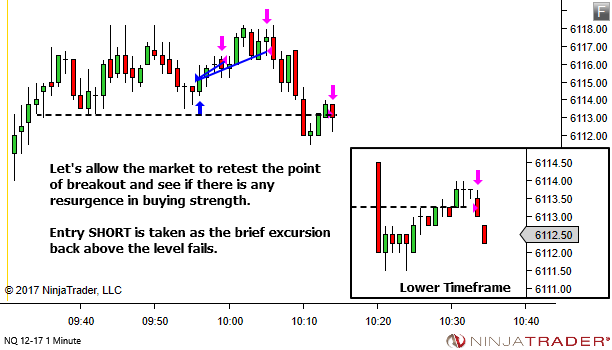 Trading decisions and actions are based upon the Trading Timeframe chart, within the context of the structure provided by the Higher Timeframe chart. 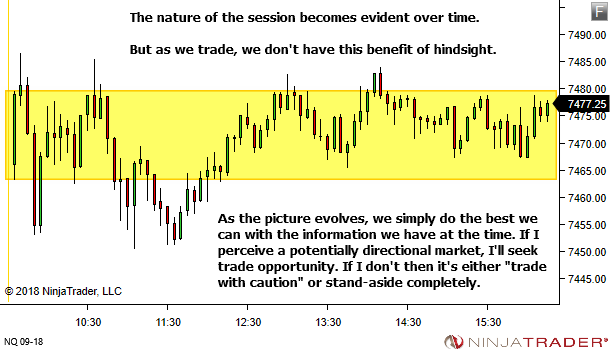 And secondly, we need to remember that the session bias is something which gradually reveals itself over time. With hindsight there will ALWAYS be a ton of opportunity you can see. 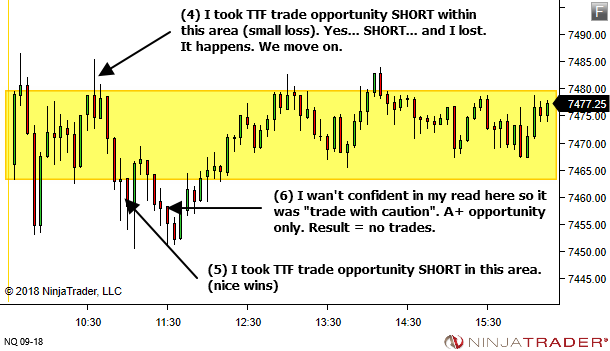 By all means learn from it post-session if it's opportunity you want to catch in future. 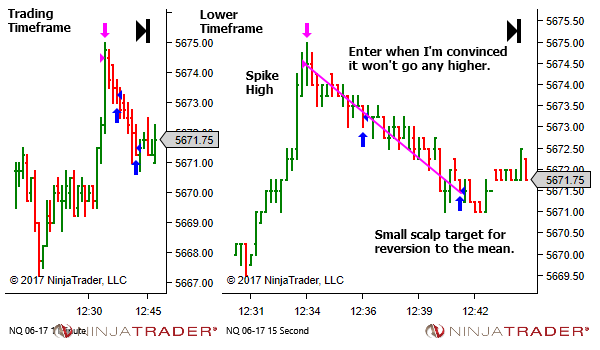 But when you're operating LIVE at the hard right hand edge of the screen, it can help to remind yourself that you don't have to trade every price sequence. 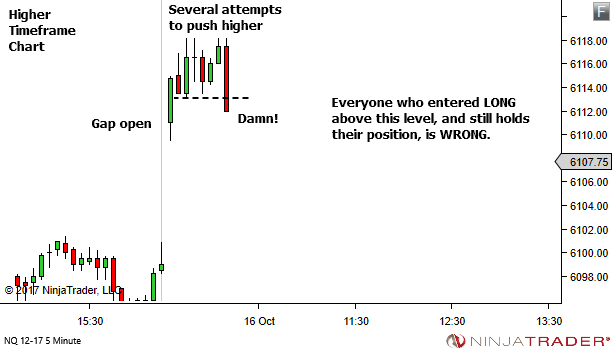 When price is moving nicely and you feel in sync with the movement… when you see edge… only then do you trade. All other times… when you don't see edge… shift that chair back so that you're out of reach of the mouse. Watch and wait for something better. Or call it a day. 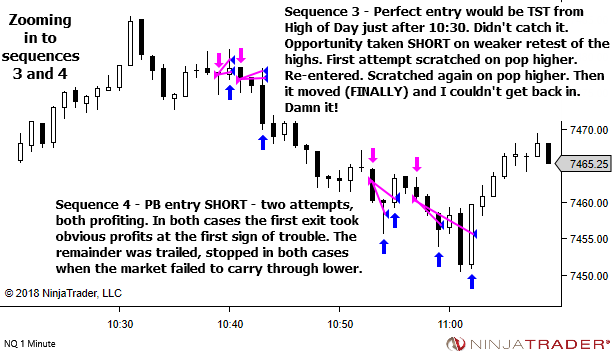 You don't have to trade every sequence. 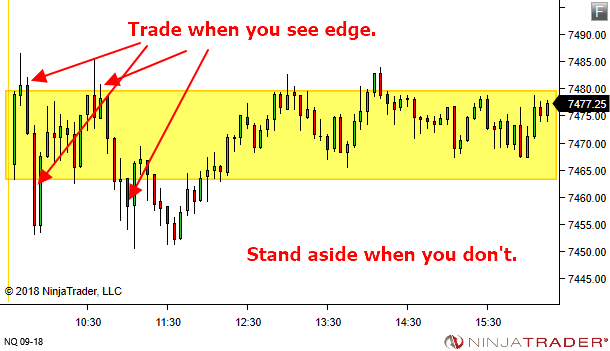 Trade when you see edge. Stand aside when you don't. 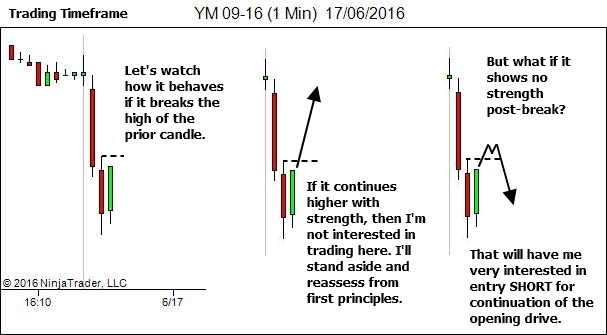 I absolutely LOVE IT when people send me charts and emails full of excitement at new discoveries or new ways of "seeing" the price movement. I received one last week that I just had to share. It's such a great example of seeking entry on the wholesale side of the market structure. I love it. An email came from G.N. 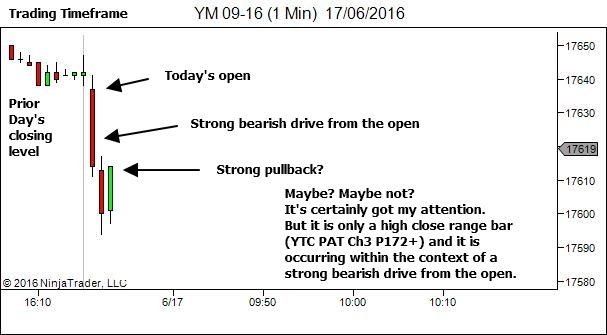 with the following chart. 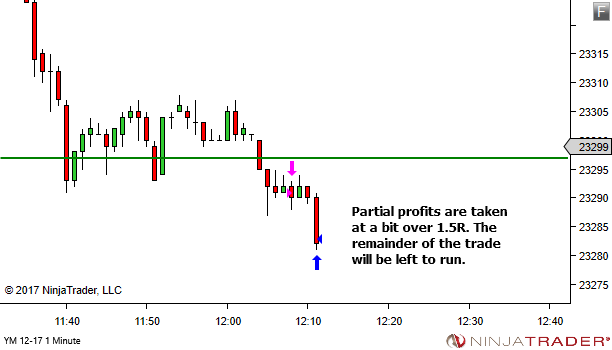 Of interest was the upthrust pattern allowing entry short, in line with the ideas discussed in prior articles – Professionals Traded Here and Confirmation is Risk. 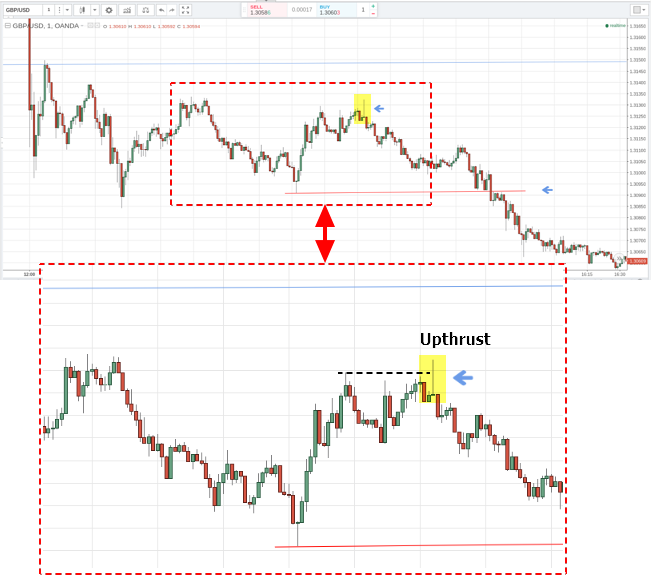 Actually, let's zoom in a little to identify the upthrust area. It's been one of my favourite concepts for years. 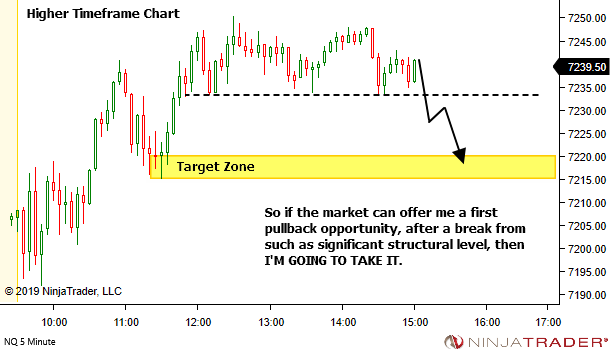 The idea of watching breakouts against market bias for failure. 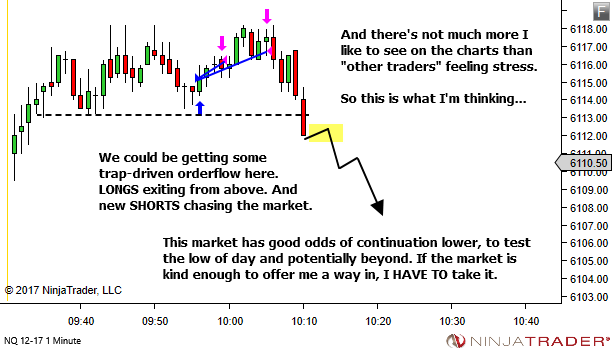 And using that to trigger entry back in the direction of the original market bias. 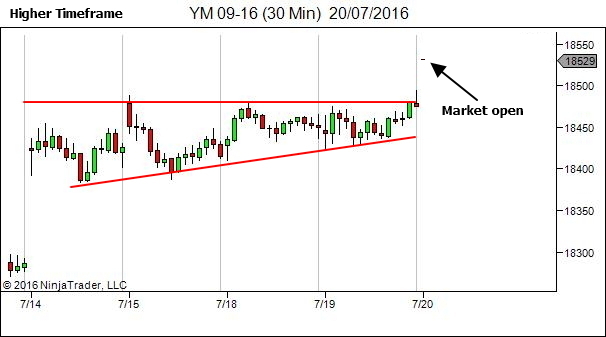 Keep an eye out for it in your markets and your timeframes. This week, let's look at the other side of traps. The fact that sometimes… the trapper becomes trapped. You don't always get it right. 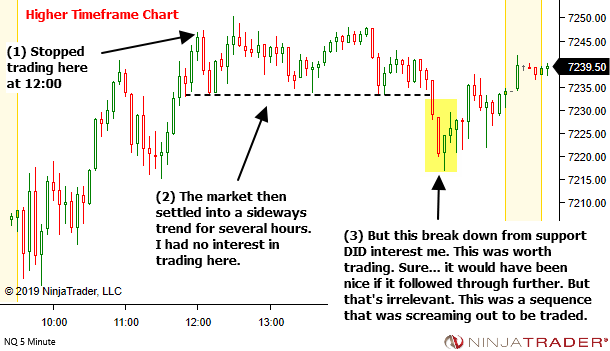 Sometimes you're "the other trader" that's caught in the trap. 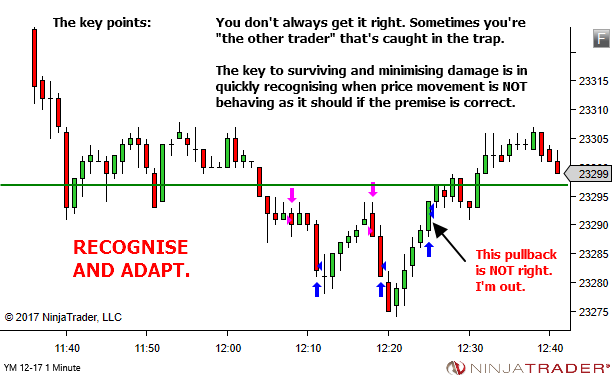 The key to surviving and minimising damage is in quickly recognising when price movement is NOT behaving as it should if the premise is correct. 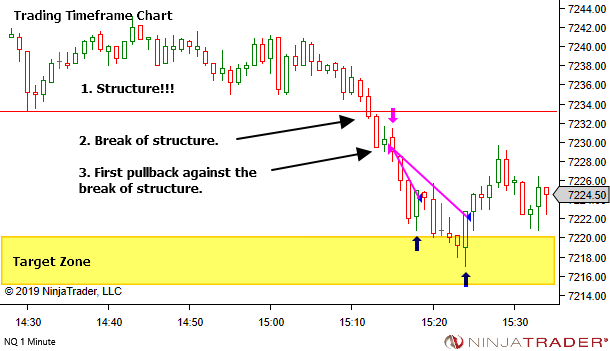 Higher Timeframe Trap – Everyone Long Above This Level is WRONG! 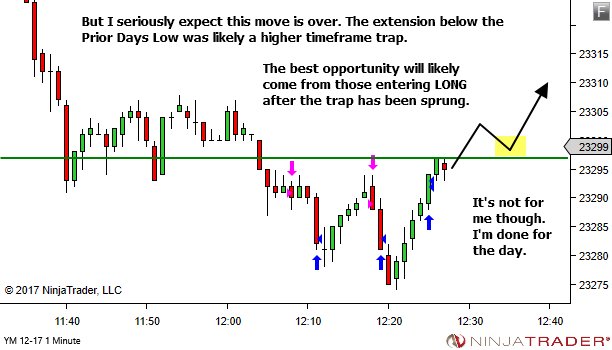 Most of the traps I trade come from the Trading Timeframe or Lower Timeframe charts. 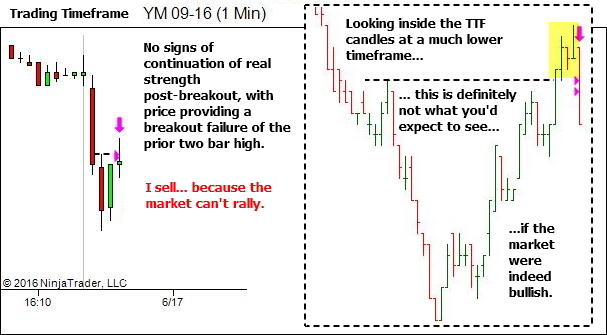 I don't watch the higher timeframe for traps. However, I do see them from time to time. 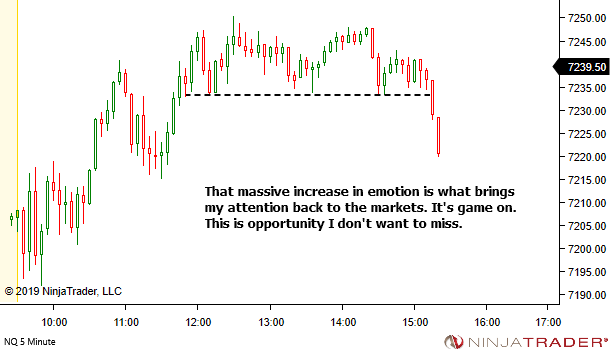 And they can provide some nice trading opportunity. Ok, "wrong" is probably a poor choice of word. 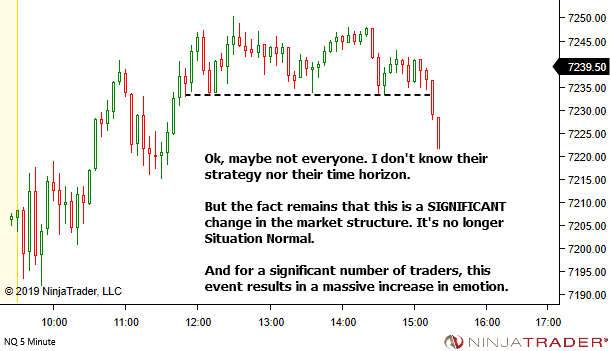 The reality is that we don't know their strategy and their timeframe. But let's just say that they're in a drawdown. 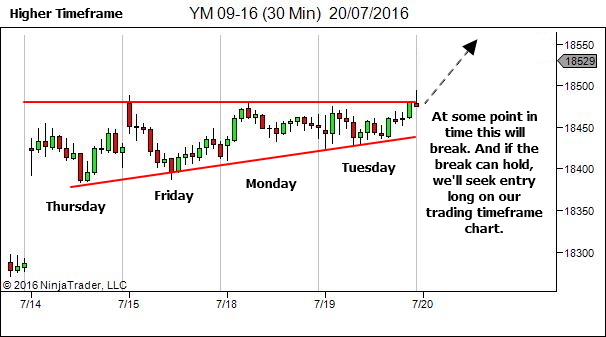 And if they're operating on similar timeframes to us, their position is NOT looking good. They'll likely be under a significant amount of stress. 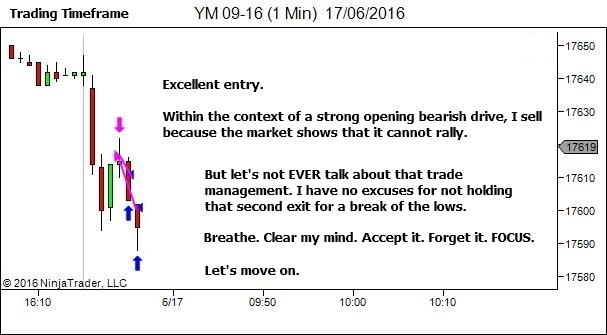 And probably hoping, wishing and praying for some way to get out of the position closer to breakeven. 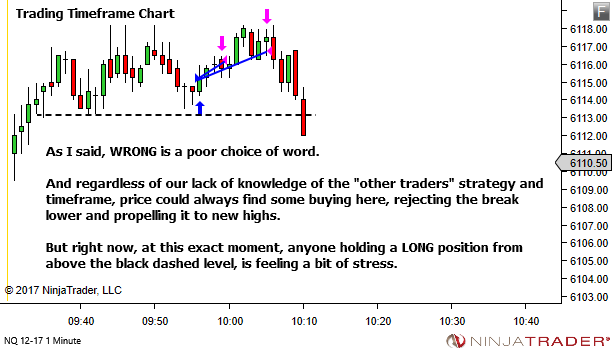 Let's drop down to the Trading Timeframe chart to see where we currently stand. 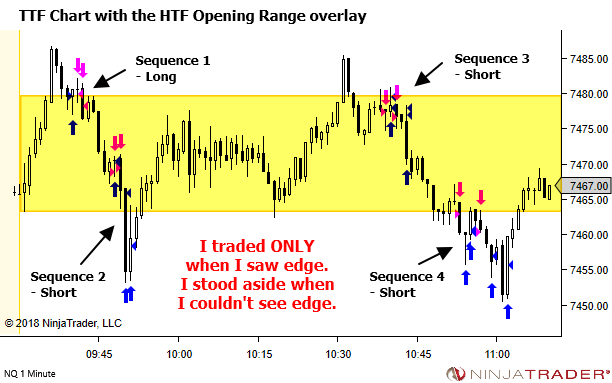 From a Trading Timeframe perspective, this was simply a BPB of a sideways range boundary. 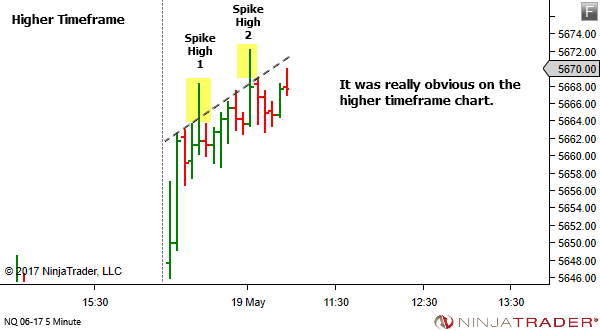 But from a wider context perspective, it was also triggering a trap on the higher timeframe chart. 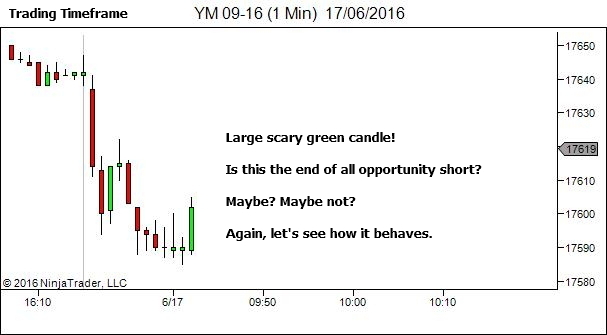 Those betting on a gap-open continuation higher suddenly found their trade premise threatened. 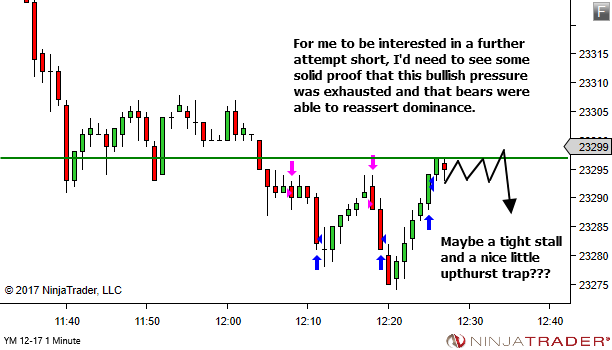 And this makes our range breakout SHORT just a whole lot sweeter. It pays to always be asking, "Is anyone trapped?" 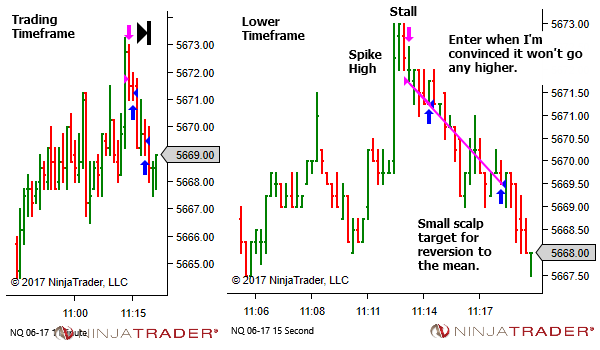 And while our focus should primarily be on the Trading Timeframe chart, we should ensure our scan also extends to the Higher Timeframe chart. 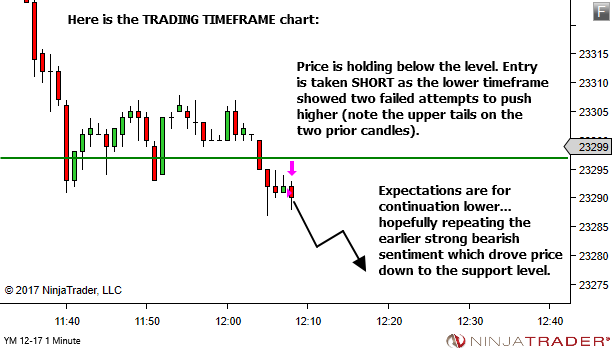 At least once per new higher timeframe candle. Maintain a feel for context. 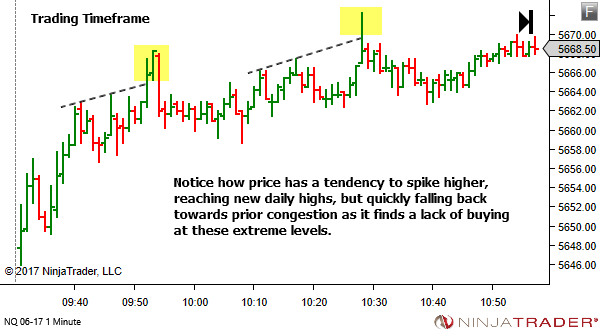 Where is the current price action occurring within the higher timeframe structure? 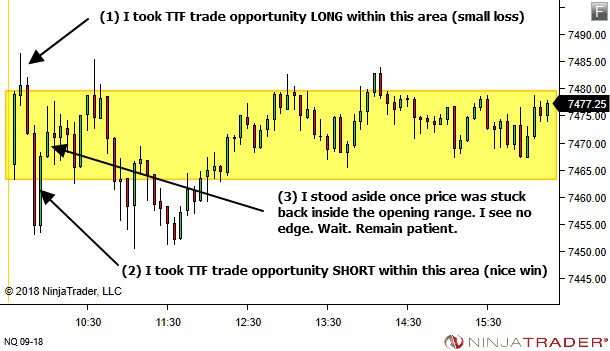 Sometimes this wider situational awareness will keep you out of a bad trade. 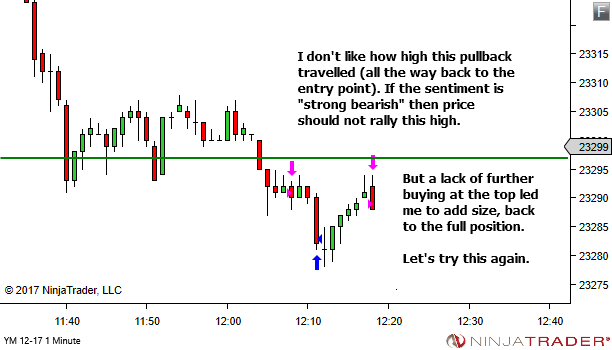 Other times, as here, it can add additional fuel to our trade idea. Always be asking, "Is anyone trapped?" 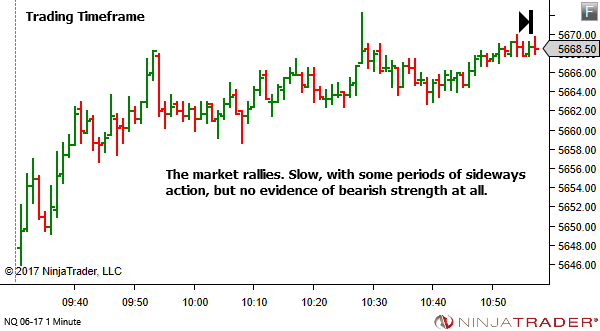 The market has opened and rallied. Not with great strength. In fact it's quite slow. 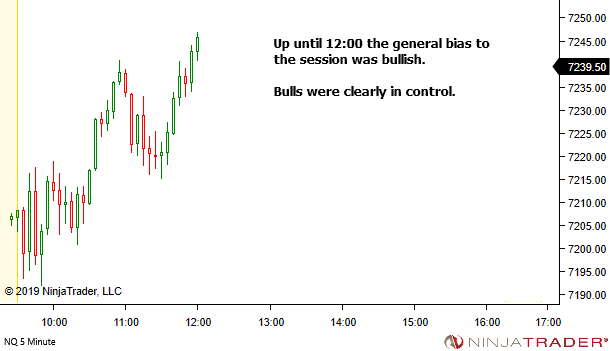 But it rallies with a clear bullish bias. 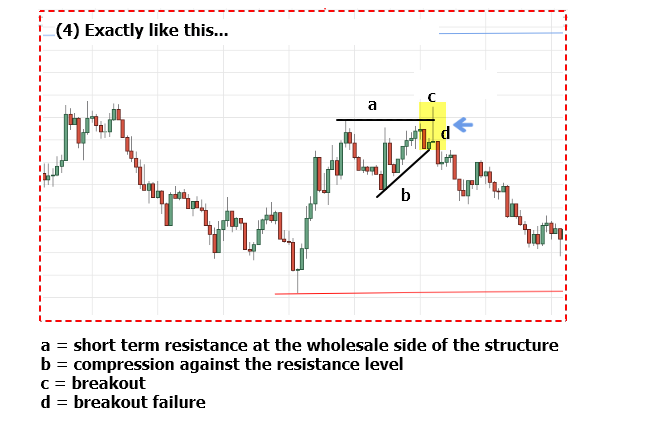 It's clear of all S/R levels, above the prior day's high resistance (now support) and well short of the next higher timeframe resistance level. 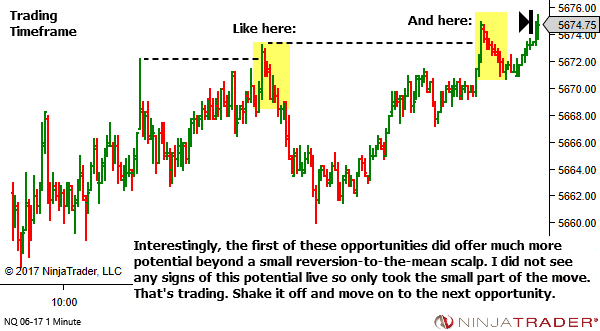 Trade opportunity in such a case is ideally sought in the bullish direction. 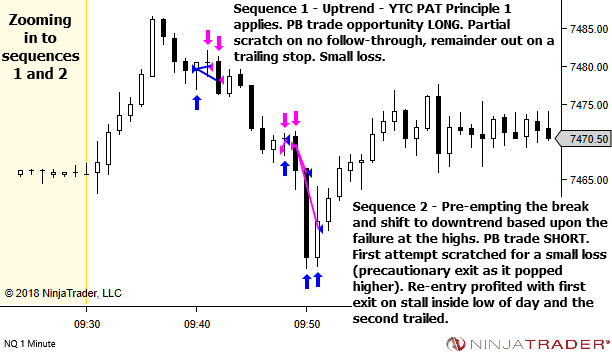 YTC Price Action Trader readers – the first and second principles apply here and we're looking ideally for PB/CPB opportunity, with the trend. 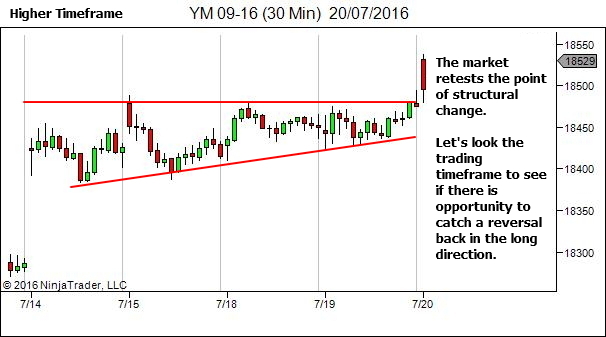 However, there are times when I'll also look to take counter-trend opportunity, within this market environment. Not always. But sometimes it's just screaming out to be traded. This is one of those times. 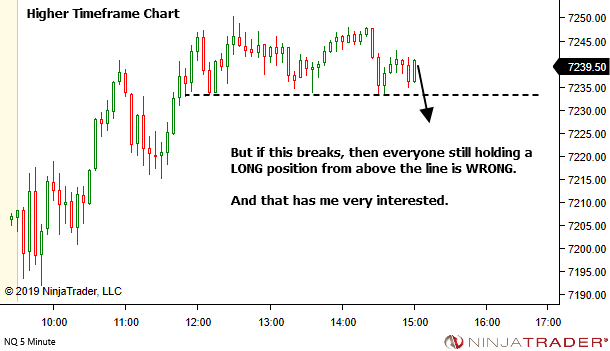 And not with any intention of catching a reversal. Just a scalp from the edges back to the mean. Here's what I was seeing. 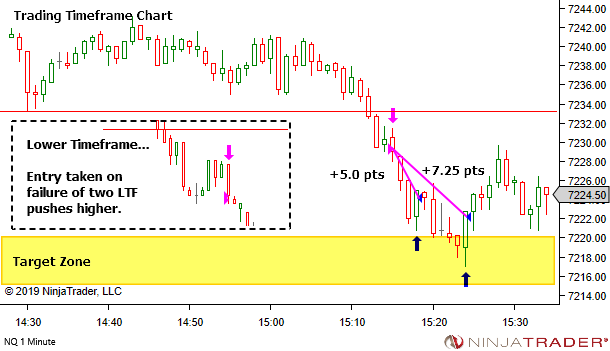 We'll look at the TTF first, but we'll follow that up with the HTF chart, because it stands out better there and is much easier to see. 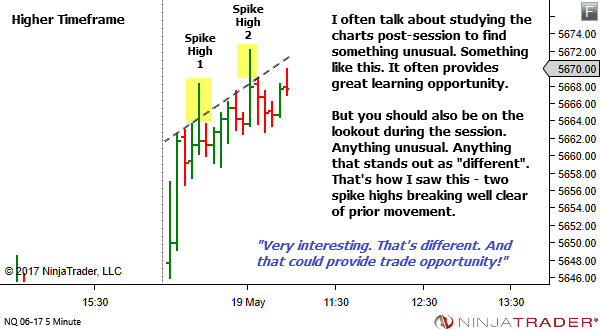 Keep watch on the charts for anything unusual. Anything that is different. 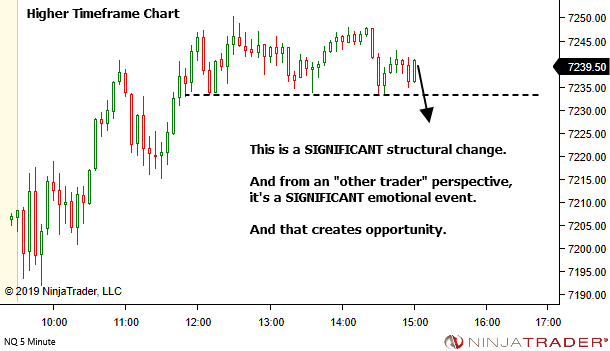 It may just provide trade opportunity.